Open width washing machine is the only one equipped with exclusive VIBRO washing system with two drums in a compartment. The system consists of specially shaped impellers in every drum in which water jets uniformly h it the full fabric width. From our wide consignment, we are affianced in supplying Industrial Textile Washing Machine. In order to meet excellent quality standards, we are supplying Textile Washing Machines. - Available in 5 to 90 kg. capacities. 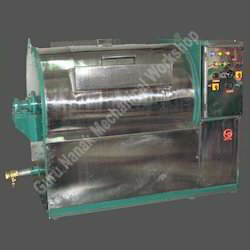 All sort of machinery required for processing, As per as processing is concerned is very simple. Aimed at the prosperous growth in this domain, we are instrumental in offering an excellent quality range of Textile Washing Machine.